These Savings Incentive Program recipients enrolled in the program in 2011 and graduated in 2013. Brian Bagge operates Sandy Knoll Dairy near Worthington. He is growing his dairy herd and sheep flock, in the hope of someday farming full time. In the meantime he supplements his income with custom farming and an off-farm job until he can create a full-time income with his own crop and livestock enterprises. Brian would like to increase the viability of his operation to allow his brother to farm with him. Brian is involved in the Savings Incentive Program to create measurable goals and organize his business plan with help from a mentor. Brian plans to use his savings match to add animals to his herd. Thomas Burkhead is a fifth generation farmer on Albrecht Family Farm in northwest Iowa near Rockwell City. Thomas is interested in restoring traditional historic farm buildings while raising specialty crops in a rural area where large farms are swallowing small-scale family farms. Thomas’ primary crops are gourmet garlic and potatoes, but he has expanded his production to include peppers, spinach, carrots, green beans, tomatoes, apples, blueberries and raspberries. He plans to increase his fruit and vegetable scale to five acres, and possibly incorporate rotational livestock grazing on additional acres. Thomas is participating in the Savings Incentive Program to purchase a small tractor with his saving match. Jordan Clasen operates Grade A Grass and Grade A Gardens, which supply the Des Moines area with certified organic gourmet wheatgrass and garlic. Jordan grows an array of other certified organic vegetables, including onions, shallots, leeks, kale, carrots and potatoes. In 2012 Jordan plans to expand his business supplying premium gourmet food and garlic to Des Moines-area customers. Jordan produces his crops on ten rented certified organic acres. The landowner is president for Orchestrate Hospitality, the company that manages Django, Centro, Gateway Market and Zombie Burger restaurants in the Des Moines area. Jordan and the landowner envision a large organic specialty crop farm with produce going directly to these restaurants as well as being a key player at the Des Moines downtown farmer’s market. Jordan is participating in the Savings Incentive Program to ensure he is on the right track to a positive farming career. He plans to buy a new tractor with his savings match. Kate Edwards’ earliest memories include tagging along with her grandpa on her grandparent’s farm. She learned of the difficulties of succeeding as a farmer and grew up wanting to see farmers return to the land after the mass exodus she observed as a child. During college studies in agricultural engineering, Kate visited PFI member Susan Jutz’s vegetable and livestock operation, read Hannah Coulter by Wendell Berry, and dreamed of becoming a farmer someday. Kate operates Wild Woods Farm near Solon, which in 2011 sold vegetables through a CSA, farmer’s markets, wholesale accounts and direct sales to customers. She plans to incrementally increase the amount of her land that is in cultivation, and in turn, increase her CSA and wholesale accounts. Kate is excited to be involved in PFI through the Savings Incentive Program. She plans to purchase a high tunnel to extend her growing season with her savings match. Glen Elsbernd has farmed for four years on 88 acres near Cresco, having increased his vegetable production acres from five to 20 during that time. He has invested in machinery to increase efficiency, production and job sustainability. “I don’t want my employees to have to work any harder than I would want to,” he says. Glen also produces row crops on his farmland using his parents’ machinery. Glen is involved in the Savings Incentive Program to save money for a down payment on more land. Karla Hanson lives with her husband and six children on a small farm near Monona. She raises a flock of free-range chickens and has recently started to build her flock with some foundation ewes. Karla plans to install a greenhouse and raise and sell specialty produce at her local farmer’s market. She also would like to build a system to provide ample water supplies to the entire farm so she can increase the amount of animals she raises. Part of the farm is enrolled in CRP and will be converted to production when it comes out of the program in five years. Karla enrolled in the Savings Incentive Program to fulfill her farm dream and save money while implementing her farm plan. Priorities for her savings match include updating the watering systems in her barns, installing a greenhouse or purchasing more livestock. Morgan Hoenig has established her farm, MogoOrganic, on family land near Mount Pleasant. MogoOrganic provides chemical-free produce to consumers in Henry County. Morgan has been building the farm image by giving talks and hosting farm tours. She had the opportunity to show President Obama and Secretary of Agriculture Vilsack her Iowa specialty crop farm in 2010. In the near future, Morgan plans to finish renovating her barn, build another cold frame, double her crop production area and hire employees. Morgan has big plans to make her farm a success and is participating in the Savings Incentive Program to set measurable goals and network with people who can help her attain her goals. She has many ideas to improve her 19th century barn with her savings match. Possible investments include: a walk in cooler, a new roof, new gutters with a rainwater collection system and the renovation of the loft area to be used as an office or sleeping quarters for farm workers. Cheryl and Mike Hopkins operate Frog Hollow Farm, a 30-acre farm near Walker. They raise animals on pasture and recently added a multi-species orchard and vegetable crops. They started Frog Hollow Farm three years ago so they could live a life aligned with their passions, beliefs and values. They started selling goat meat through the Iowa Valley Food Coop in 2011. Cheryl and Mike plan to expand and diversify in a systematic way to improve profitability while keeping environmental stewardship and animal welfare central to their operation. They are involved in the Savings Incentive Program because they believe the components of the program will help them achieve their goals. Cheryl and Mike plan to invest in a portable corral system for their goats or a high tunnel with their savings match. Farming has been Jay Jung’s lifelong dream. He started his farm business from scratch near Colwell on rented land, raising and selling broilers last year. He plans to add bred ewes and his first row crops to his operation in 2012. Jay aspires to create niche operations to become a successful farmer and to change the perception in his area that you must cultivate at least 500 acres to be a real farmer. Since Jay is not taking over a family farm, he is participating in the Savings Incentive Program to increase his support network and asset base. He plans to purchase a six-row planter with his savings match. Drew Lietz grew up on a row crop farm west of Alta and began helping on the farm in junior high. It was early on during college that Drew realized he wanted to return to farm with his family. Drew has been renting land from his grandma (east of Pocahontas) and growing row crops with his family since 2009. He now owns a half share of a grain cart and a few other small implements. Drew graduated from college in December 2011. He plans to farm and use his agriculture business degree working at an accounting firm (primarily doing taxes) during the off season until he is able to farm full-time. Drew is part of the Savings Inventive Program to save money that he will use to purchase farmland or equipment and expand his family’s operation. Brian and Cheryl Ness each grew up on a farm and aspire to farm as a family. Their desire is to work together as a family and give their seven children opportunity to develop their own businesses, should they desire. They began Thousand Generations Farm two years ago on farmland near Newton. They operate a CSA and have raised hogs, pastured broilers and layers. They value the equipment they own and plan to slowly invest in additional equipment to make their farm productive and efficient. They decided recently to discontinue their hog operation and increase the scale of their vegetable, broiler and laying operation. They are currently working on infrastructure for grazing and at some future point they would like to pursue adding livestock into the operation. Brian and Cheryl are participating in the Savings Incentive Program for the opportunity to have a mentor as well as to be held accountable for completing a business plan. They have several ideas for their savings match including a high tunnel for season extension, fencing and water infrastructure for rotational grazing and additional mobile housing for pastured poultry. Jacob Petersen’s family farms near Knoxville and raises 600 ewes, 300 beef cows, 800 acres of row crops and 300 acres of hay. The majority of the family’s row crops are certified-organic, and they are continually transitioning more acres to organic. Jacob owns 90 of the farm’s cows, 40 ewes, and he recently purchased an East Friesian ram to introduce dairy genetics into the herd. Jacob mows the hay on the farm and performs custom mowing for other farms. He hopes to begin construction on a sheep dairy milking parlor in the next few years. Jacob is part of the Savings Incentive Program to save money for his sheep dairy and to gain knowledge and support from PFI’s network of farmers. He plans to use his savings match to purchase equipment for his milking parlor. Ellen Walsh-Rosmann and Daniel Rosmann farm with Daniel’s parents, Ron and Maria. Rosmann Family Farms consists of 700 acres of certified-organic corn, oats, soybeans, small grains, popcorn, pasture and hay. They have an organic cow-calf operation and an organic farrow-to-finish hog operation. In addition to farming with their family, Ellen and Daniel own their own farmland and business, Pin Oak Place, located at Rosmann Family Farms. In 2011 they started a CSA, sold produce to local grocery stores, raised their own row crops utilizing a seven-year rotation and purchased two bred dairy goats in the hope of starting a goat dairy operation. They plan to expand upon these endeavors and are evaluating yet other enterprises to include in their growing farm business. Ellen and Daniel are participating in the Savings Incentive Program to develop a habit of saving. They would prefer to use their savings to pay for farm projects rather than borrow money and have to use the income they generate to pay off loans. Ellen and Daniel plan to invest in their goat dairy operation or a vegetable packing shed with their savings match. Michael Salama returned to Iowa in 2010 to help with his family’s business, Northwest Greenhouse and Floral in Boone. Northwest Greenhouse has been in operation since 1973. He and his family provide retail and wholesale flowers and bedding plants throughout the Midwest. Mike aims to lower energy costs and become more efficient to improve profitability. He says that they will continue to grow cut flowers and potted plants year-round and would like to add greenhouse produce production to their business, especially during the winter months. Mike is currently building relationships with businesses and organizations like Iowa State University Dining and experimenting with winter greenhouse food crops to find the best varieties for the rapid growth he will need to be selling greenhouse produce in two years. Mike believes the demand exists for fresh, local produce, especially in the winter months, and that by meeting this demand, he can increase the profitability of the family business. Mike is involved in the Savings Inventive Program to gain knowledge from other PFI vegetable farmers. He also hopes to learn more about renewable energies and efficiencies for greenhouses. Mike plans to purchase a bio-mass boiler with his savings match. Jordan Scheibel has worked full time for Andy and Melissa Dunham’s Grinnell Heritage Farm near Grinnell since April 2010. This past season Jordan grew his own crop of produce and herbs, on a plot of land at Grinnell Heritage Farm, part of which he sold through the Grinnell farmer’s market, Grinnell Local Food Buying Coop, the Iowa Valley Food Coop and directly to consumers. Jordan wants to double his production area at Grinnell Heritage Farm and incubate his business within their larger operation while continuing to work for the farm until he can invest in his own farm and equipment. Jordan is a recent college graduate with student loans to repay, no land and few assets. He is participating in the Savings Incentive Program to save money for an independent farm business. He will invest his savings match in the purchase of a used truck that is needed for farmer’s markets and for farm-related hauling. Dave Schmidt grew up in Cedar Falls and spent time on his grandparent’s farm near Chester. In 2002 while attending Iowa State University, Dave decided he’d like to farm someday. Unfortunately, Dave had little experience and no immediate access to land—his grandparent’s had sold their farmland. Dave moved to Idaho and eventually northern California where he worked for the Nature Conservancy and U.S. Forest Service but he never stopped looking for opportunities to return to Iowa and farm. In 2009 Dave was contacted about converting a Garwin farmer’s row crop and CRP ground to a pasture-based cattle operation. Dave returned to Iowa in 2010. He began grazing cattle on the Garwin farmer’s land while making preparations for an intensive rotational grazing system. Dave owns cattle, laying hens, honeybees and a number of farm assets under his LLC, Rock Valley Livestock. He is helping the landowner improve his farmland while expanding his own herd and direct marketing beef, eggs and honey. Dave would like to buy his own Iowa farmland someday. He is part of the Savings Incentive Program to maximize his chances of creating a successful small business and feels a mentor will be a big asset to his business development. Dave plans to purchase bred heifers with his savings match. Luke and Linsey Schuldt returned to Luke’s family’s century farm near Tripoli five years ago to begin farming land that hadn’t been in production for 10 years. They started by planting hay and raising cows. Early on one of the cows they purchased had Johne’s disease and spread it to the entire herd. Luke and Linsey had to rebuild their beef operation from scratch and currently have 10 Hereford cow-calf pairs. They continue to raise hay and have added corn, beans, a small vegetable plot and laying chickens to their operation. They have purchased a portion of the family farm and plan to buy the rest as well as rent additional acres for row crops. They are seeking more custom hay work to increase farm income so they can update their cattle yard and increase their cow-calf operation. Luke and Linsey want to learn how to grow their farm, become more efficient and increase their chances of success through the Savings Incentive Program. They are looking forward to having a mentor as well as receiving guidance to develop a business plan. They have a lot of ideas for their savings match such as buy additional Hereford cattle, add a new bull to the herd, purchase more of the family land, buy a new grain wagon or update the cattle yard. Grant Schultz started Schultz Heirloom Farm in 2009 near Eldridge. Always seeking out new knowledge, Grant traveled to New Zealand in the winter of 2011 as a WWOOFer (World Wide Opportunities on Organic Farms). WWOOFing farmers trade their skills and labor for room and board as they explore a new country. Grant’s brother Adam will join Schultz Heirloom Farm in 2012, leveraging his culinary experience to expand their market for heirloom vegetables. The Schultz brothers have a farm plan focused on growing and selling artisanal heirloom food and value-added products. They have created ‘Four Pillars’ to guide them: Sustainable Income, Always Improve, Be Unique, and Leverage Technology. They are participating in the Savings Incentive Program to purchase tools to create an efficient, viable organic vegetable operation in Iowa. Their list of potential savings match investments includes a vegetable transplanter, a lettuce seeder, or a potato-garlic plow. 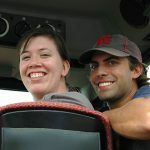 Michael Von Weihe returned to rural Carson in southwest Iowa in fall 2009 to begin his farming career after receiving a Bachelor’s in Horticulture from Kansas State University and a Master’s in Horticulture from Michigan State University. Michael’s college experiences fostered an interest in local foods and in 2009 he took an active role in advancing the state of local foods in Iowa by producing fruits and vegetables in his native community. Michael has spent the last two years increasing production and improving the business aspects of his farm. In 2012 Michael plans to increase his production capacity and plot a course for a promising future for Von Weihe Farms Produce. His efforts include season extension and diversification. Michael applied for the Savings Incentive Program to practice saving income on a regular basis. He’s also looking forward to networking with other beginning farmers and learning from the resources PFI provides. Michael would like to purchase a six-row pinpoint seeder or a plastic mulch layer with his savings match. 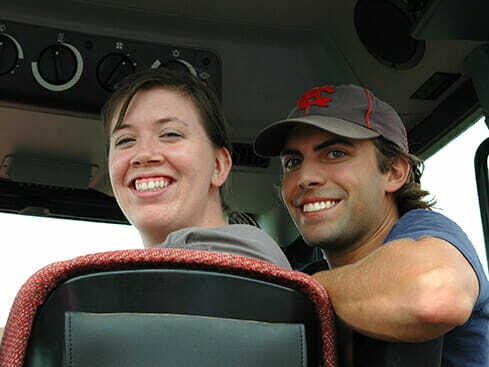 Jake and Amber Wheeler purchased a 160-acre farm near Monroe to realize their vision of raising their family on a farm. Eighty acres of the Wheeler’s farmland are tillable of which 20 acres are planted to forage and 60 are farmed conventionally. On the remaining ground, Jake and Amber practice intensive rotational grazing—they are in their third year of year-round grazing. They use chicken tractors to move portable pens for their pastured broiler chickens, and the Wheeler children sell the eggs from their free-range layers. Jake and Amber would like to expand their poultry operation and add sheep, duck, turkey, vegetable and fruit-tree enterprises to the farm. They lack proper animal shelter so they would like to add and improve the outbuildings on the farm. Jake and Amber are participating in the Savings Incentive Program to provide for their financial needs so that Jake can work on the farm full time. They plan to invest in better cattle genetics, poultry netting or a tiller with their savings match. Erin Wilson grew up on an organic, grass-based dairy in northeast Iowa and moved to a farm near Paullina after marrying Torray Wilson, a farmer who grew up on a diverse family farm. Erin and Torray run a flock of 200 ewes with lambs, custom graze beef cattle, and as of Jan 1st, 2012 operate a new grass-based dairy. They also farm with Torray’s parents, Dan and Lorna, who raise pigs, poultry and organic crops. Erin and Torray’s plans include converting all of their family land into pasture; developing their grass-based enterprises to be complementary, efficient and profitable; purchasing land of their own; and bringing into the operation more of Torray’s siblings. Erin is involved in the Savings Incentive Program to improve her saving habits. She also wants to finish a business plan and appreciates the structure and follow-through that is a part of this program. Erin would like either to buy steel to build a portable corral system with her savings match, or she would like to put the savings toward a prefabricated portable corral system.